Since the Fall of 2018 I have been engaged in three separate writing projects. 1) One project was a shorter, one-chapter historical record to be included a book by Debbie McCann on Brookberry Farm, located in Winston-Salem, Forsyth County, NC. This 800-900 acre farm is located on the outskirts of what used to be the Moravians' Wachovia Tract, granted to them in 1753. Many of my relatives lived on land just to the NW of Wachovia, part of which overlaps with the modern-day Brookberry Farm. Debbie hopes to have her book published later this year (2019). I sent my completed chapter to Debbie in February. 2) Last Fall I began writing a long-overdue book on my PATTERSON ancestors. For years I have questioned how much content to include in a book or books on the Pattersons. Robert Patterson was my 6x-G-GF and he lived from the early 1700's until 1775. Writing about just him could fill multiple books. On the other hand, his grandson John Patterson - my 4x-G-GF - has long been a well-known figure in our family tree. There are thousands of his living descendants across the USA and Canada today. However, for decades, we could not figure out who John's parents were. Therefore, I chose to focus this book on John's father, Thomas Patterson (son of Robert), and Thomas's family. Some details will be given on Thomas's parents and siblings, but the greater focus will be on Thomas and his immediate family, and their descendants. It will also focus on the family of Thomas's wife, Margaret HARRISON. It took many years to discover who John's father was, and who the legendary "brothers" were that my family has talked about for generations. Thus, "LEGENDS REVEALED..." is the beginning of the title of this book, as the legend of John's father is revealed, and the legend of the "brothers" is also revealed. This work is still on-going, but thus far, well over 300 pages have been put together. My goal is to finish this book in 2019. 3) Working on the "Legends Revealed" book has forced additional research in a few key areas, naturally. One such area involves the Church Minutes of Newfound Baptist Church from western NC, a church which began in 1802. My ancestors and many of their relatives began this church and were heavily involved in it through 1815. The third project I am finishing up now is an article to be submitted to the quarterly magazine called "A Lot of Buncom" or ALOB, which is published by the Old Buncombe County Genealogical Society. Harald Reksten (and Greg Brookshire) have been pushing me for years to get this work completed. This initial article will focus on the early years (1802-1815) with some introduction about the minutes themselves and the difficulty one has in reading the handwriting. Many attempts have been made over the years at interpreting the names therein, but many errors have been published. I have worked diligently to learn about these families and to get the names correct. I am finishing up the final editing now and hope to submit this article during April, 2019. Once the ALOB article is completed, I will then be in a better position to leverage those edited minutes and incorporate them into the "Legends Revealed" book. This book will continue to be my primary focus during the remainder of 2019. 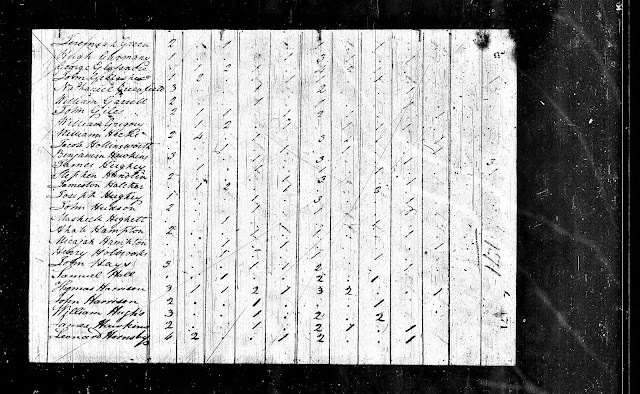 For years I've read online about the Thomas Harrison of Buncombe Co., NC who lived there during the late 1790's and early 1800's, being in the 1800 census in a household of 14 members. However, I have checked the transcripts of that census numerous times never to find him listed. There is a John Harrison listed, but not a Thomas Harrison. I also kept forgetting to check the original microfilm of that census, which you can do online in many places, including ancestry.com if you have a membership. I finally remembered the other night to check for this since I am writing a book on the Pattersons and their relatives pertaining to that time period. And surprise, surprise. The transcribed version on the OBCGS site simply missed this line. I wonder how many others were missed? Thomas Harrison WAS on the microfilm version of the 1800 Buncombe census, right before John Harrison. See below. This serves as a strong reminder to me to always check the original source, when at all possible.